This chocolate cake has been a family favorite years before I even had my own family. It was made many times by my mom and I think I made it for the first time for my dad's birthday after I had been married for three months. Since then, I have made it a multitude of times. It starts with a boxed mix which places this cake in the easy-peasy category. You can take that theme all the way through if you buy a ready-made chocolate frosting (which I've done) to finish it off, but I usually opt for a homemade frosting, which was the cake this time. Hershey's cocoa is in my pantry at all times and right there on the canister is the frosting recipe I use: "Perfectly Chocolate" Chocolate Frosting. So simple and yummy! My daughter requested this for her birthday the other day, and I was happy to comply:) The m&m's were added as a festive touch and they match the cute, mini bunting that I picked up at Target a couple of weeks ago. If you have a hankering for chocolate, you've found the perfect way to satisfy it in record time with this recipe! Combine cake mix, pudding mix, chocolate chips, milk, and eggs in a bowl. Mix by hand until well blended, about two minutes. Pour into a greased (and "floured" with cocoa) bundt pan. Bake at 350 degrees for 50-55 minutes, or until cake springs back when lightly pressed. Do not overbake. Cool 15 minutes before removing from pan. Let cake cool completely before frosting it. You had me at "in the easy peasy category"! Now that's my kind of cake! You know it's a good cake when it's made over and over again! And with it being so easy-I give it five stars! That is gorgeous and I love the bunting! Gorgeous chocolate cake! I bet the pudding mix adds a delicious touch! I love how you took and ordinary cake and made it extra special. What a neat family recipe and I think your addition of candies is really cute Sue! This look absolutely incredible! Can't wait to explore more deliciousness on your beautiful site! 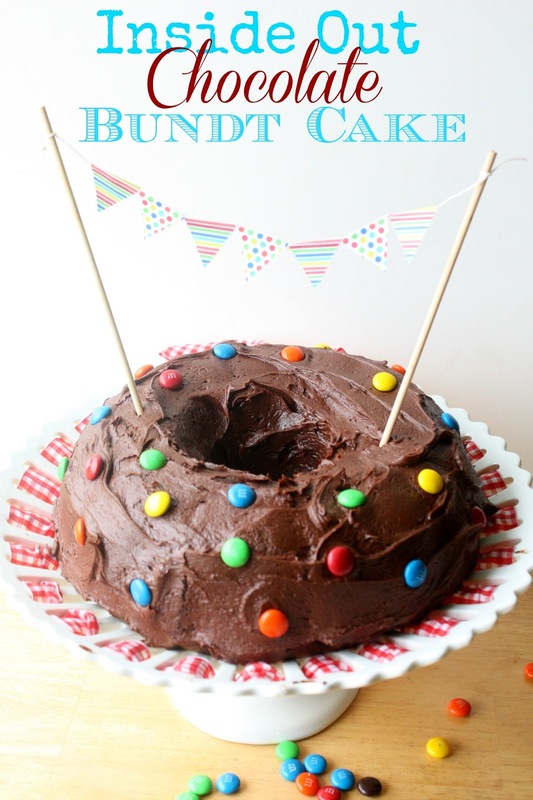 Sue..this bundt sounds so good and it looks so festive and fun! Old family favorites can't be beat. I haven't made a bundt in ages. I think it's high time I do so! Sue, this looks delicious! I think this would be a family favorite of our too! Wow that's just about the easiest cake recipe I've ever seen Sue! :D Gorgeous! 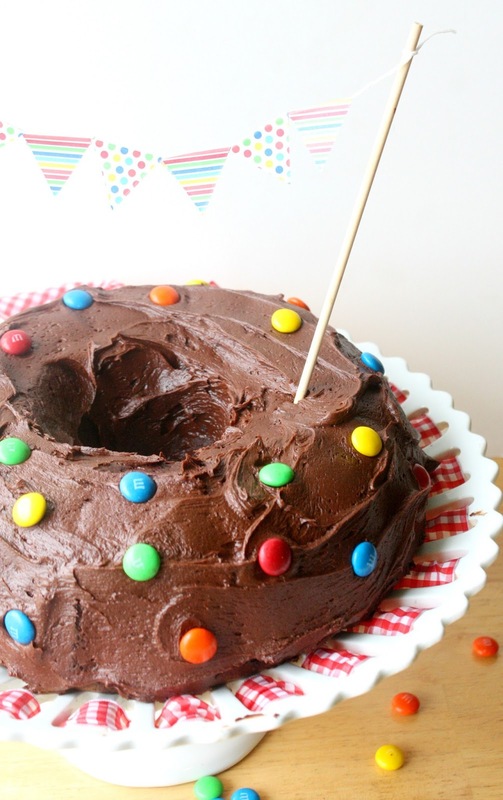 What a fun cake and as you said, so easy to prepare. Why my kids always ask for something hard to make? hahaha....Your daughter is so nice to request this simple yet decadent cake. A delicious bundt with an adorable bunting! My issue with Bundt cake is that no one frosts them - give me the frosted kind - always! You can even add a little extra frosting on the side. This has been a favorite in our family for years, but I couldn't find my recipe. It came with my bundt pan, but it did not call for frosting. The idea is that the chocolate chips act as frosting, on the inside. No frosting makes it especially easy to make.